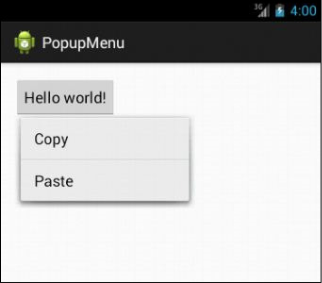 In this article we will see the step by step how to create a menu to your small or big Android Application. 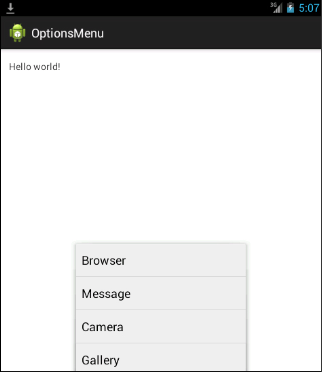 The Android platform allows you to create a rich UI consisting of several useful components, such as menus and tabs. It also allows you to enhance the appearance of your apps by using styles and themes, thereby, providing an enriching user experience. To enhance the UI of your app, you can also create extended or customized views. These views provide you further flexibility for creating an app, without restricting yourselves to the limited capabilities of built-in views. This article explains how to use menus. Further, it discusses how to customize views in order to fulfill specific requirements of an app. While developing apps, you need to ensure that the UI created is attractive, occupies less space, and is easy to use. Menus are an important part of the UI. A menu consists of a set of commands. These commands are accessible on the device through a button, key, or gesture. Using menus, you can implement easier navigation within an app and between the apps. User Special Note: Gestures are used by smartphone users to interact with touch screen devices intuitively, such as a swipe movement with a finger. Android provides an API in the form of the Android Gesture Package, which allows you to store, load, draw, and recognize such gestures. Options menu: This is the primary collection of menu items for an activity, which appears when the user presses the MENU button on the emulator/device, as shown in the following figure. Context menu: This is a floating list of menu items that appears when the user touches and holds a view that is registered to provide a context menu. The following figure shows a context menu that appears when a user long presses the entry for a contact in Contact Manager. Popup menu: This type of menu displays a list of items in a vertical list that is attached to a view. It provides extended actions that relate to regions of content in an activity. The following figure shows a popup menu. The options menu includes basic actions and necessary navigation items for an activity, such as a button to open the Search app. The options menu items are accessible by using the MENU button. <menu>: The <menu>element is the root node for the menu resource and acts as a container for the menu items defined by using multiple <item>and <group>elements. <item>: The <item>element is used to create a menu item. The <item>element can consist of nested <menu>elements that are used to create submenus. <group>: The <group>element is an optional element that allows you to categorize the menu items, thereby, allowing sharing of properties, such as visibility and active state. The following figure shows an options menu that is displayed when a user presses the MENU button. When an activity is created and the MENU button is clicked, the onCreateOptionsMenu()method is called only once. This means that the system inflates the menu only once, and keeps on using the inflated menu until the activity is destroyed. You can change the options menu after it has been created in the onCreateOptionsMenu()method by using the onPrepareOptionsMenu()method. This method dynamically adds, removes, or enables/disables menu items depending on the current state of an app. User Special Note: In Android 2.3 and lower, the onPrepareOptionsMenu () method gets executed each time the user opens the options menu. Whereas, in Android 3.0 and higher, it is a must to execute the invalidateOptionsMenu() method to update the menu because the menu is always open. The system will then call the onPrepareOptionsMenu() method to update the menu items. A context menu is similar to the menu that gets displayed when the user performs a right-click on a PC. A context menu is used to provide access to actions that are specific to an item. 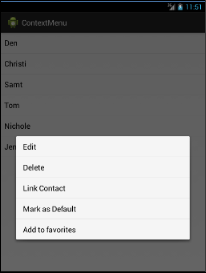 In Android, a context menu gets displayed when the user performs a long press on an item, which is registered to provide a context menu. 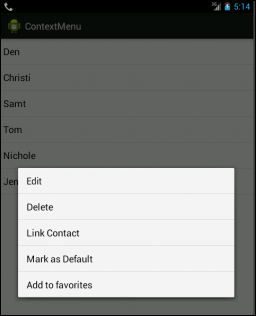 Context menus can be created for any view, though they are mostly used for items within a list view. When any item in a list view is long pressed and the list is registered to provide a context menu, the selected list item animates its background color in order to signal the user about the context menu getting activated. User Special Note: You can also create contextual actions by using the contextual action mode. This mode is created by using the system implementation of ActionMode, which is a class that displays a contextual action bar with action items at the top of the UI. If an app allows, it enables the user to perform an action on multiple items at once in the app. onCreateContextMenu(): This method is called when a context menu is about to be shown. ContextMenu: Refers to the context menu object that is displayed for the activity when a long press is done on a view. View: Refers to the view on which a long press was done to display a context menu. q ContextMenuInfo: Refers to the extra information about the menu item depending on the view for which the context menu is built. Within the onCreateContextMenu()method, you need to add items to the context menu. You can add items to the context menu by using the Menu.add() method. This method takes four parameters, which are described in the following table. The group ID of the group to which the menu item should belong. If you do not want a menu item to belong to any group, use the value, Menu. NONE, for this parameter. A unique ID for the menu item. If you do not want a menu item to have a unique ID, use the value, Menu. NONE, for this parameter. The order of the menu item in the list. If you do not want any specific order for the menu items, use the value, Menu. NONE, for this parameter. The text to be displayed on the menu item. The output of the preceding code is displayed, as shown in the following figure. Instantiate a popup menu with its constructor. It uses Context of the current app and View to which the menu should be anchored. Use MenuInflater to inflate your menu resource into the Menu object. This object is returned by a method named PopupMenu.getMenu(). However, you can use the PopupMenu.inflate()method for the API level 14 and above. // This activity implements OnMenuItemClickListener . The output of the preceding code is displayed in the following figure. There are various situations when the requirement of an app goes beyond the built-in views available. For example, you need to create a toggle button for an image being displayed as the background of your app. If the image is visible, the toggle button should hide it, and if the image is hidden, clicking on the button would make it visible. This toggle button is a custom view that you would need to create to fulfill the specific requirement of your app. By customizing views, the look and feel of an app can be changed completely. This further helps in creating UIs that are uniquely suited to a user’s need. One such way of implementing custom views is by creating compound views. // TODO Auto-generated constructor stub. Once you have extended your class, you can now use the views that you want to design the UI. 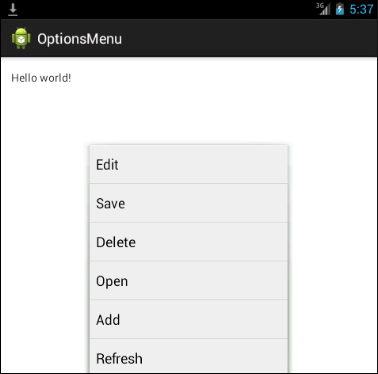 In this article we discussed creating Menus in android apps. We also explored the concept of Views in androids which helps developers manage Menus more effectively.